Here's how it happened: While perusing a tutorial on Heroku, I read that it is not a good idea to store sensitive connection information (i.e. database user and password, API keys, etc.) in your config files. In fact, it is recommended that, when storing information in a config file you ask yourself the question: if I open sourced my application today, would any credentials be compromised? However, once I did this and re-compiled it in IntelliJ, I started to get a whole bunch of errors from Play 2 at runtime saying that it couldn't find the configuration keys that it had no problem finding before. After some poking around, I realized that these errors only seemed to be occurring when I compiled my project in IntelliJ, and not if I compiled it via play run from the terminal. A little more digging revealed that this was an issue for Mac OS X in general. The solution? Unfortunately, there is no general solution. That is, there's no way (that I know of) to get all apps to see your environment variables as you'd expect. However, IntelliJ does provide a facility for defining per-configuration environment variables. Here's how to do it. 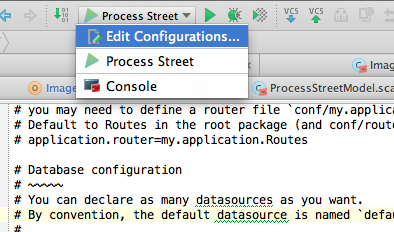 First, in the IntelliJ toolbar, click Edit Configurations. 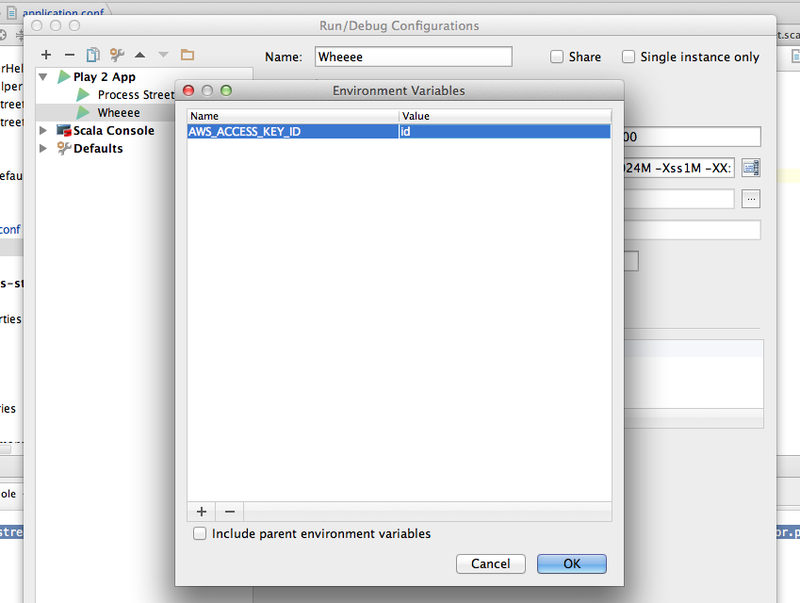 Next, find the configuration that is using the environment variables, and click the icon beside the "Environment variables" field. Now, add all the environment variables your application is looking for and click "OK". That's it, your IntelliJ program should now properly find your environment variables!